Published on Friday, July 14, 2017. This article appears in the June/July 2017 issue of American Craft Magazine. To create his work, Dougherty calls on local volunteers. He is often assisted by metalsmith Elsa Hoffman and potter Sam Dougherty, Patrick’s son. Once upon a time, there was a man who traveled the land, weaving sticks into giant, magical forms that enchanted all who beheld them. 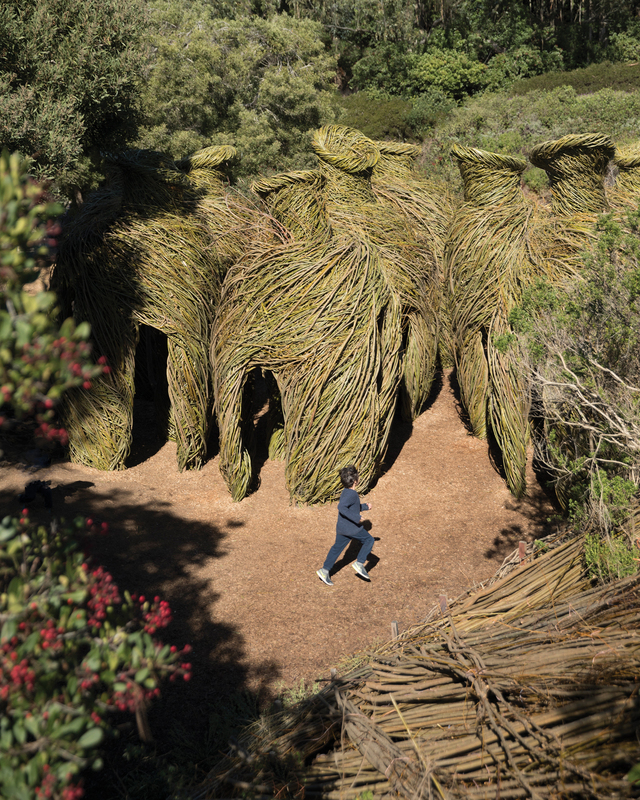 We refer not to a folk hero of yore but to contemporary artist Patrick Dougherty, whose large-scale environmental sculptures made from intertwined tree saplings have been delighting viewers for more than 30 years. There’s an undeniable storybook charm to his works, which have graced museum grounds, university campuses, and botanical gardens around the world. He even built a piece in the moat of a 15th-century castle in France; does it get any more fairy-tale than that? 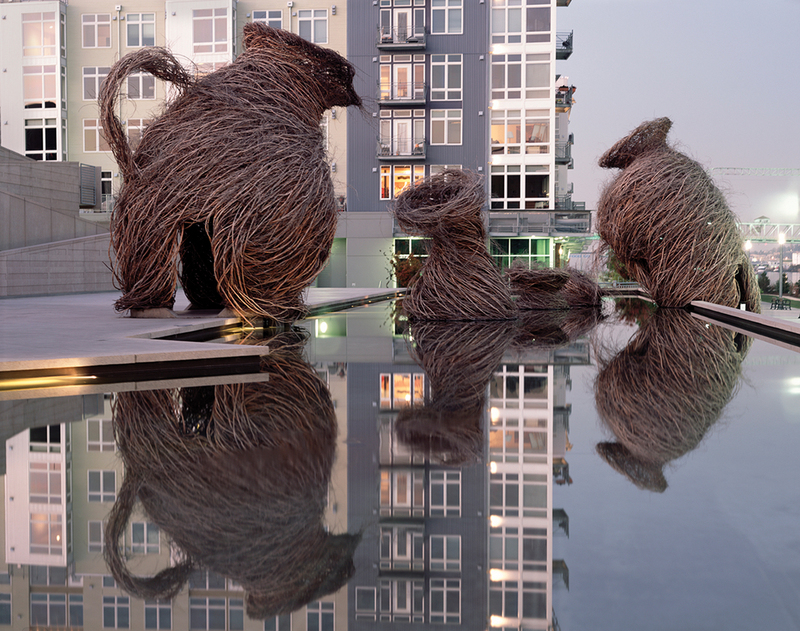 Nestled high in trees, clinging to buildings, or striking animated poses on their own, Dougherty’s conjurings twist and whirl, like tornadoes or tumbleweeds. Often they seem to be dwellings – a hobbit house, a wigwam, an onion-dome palace. Or they’re anthropomorphic, suggesting huddled figures or a pitcher tilting to pour. Bearing such cheeky titles as Come Hell or High Water, Raring to Go, and Wild as All Get Out, they’re eccentric and a bit mysterious, as if whipped up in the night by elves or space aliens. In reality, each is the sophisticated, collaborative creation of the artist and a crew of local volunteers. 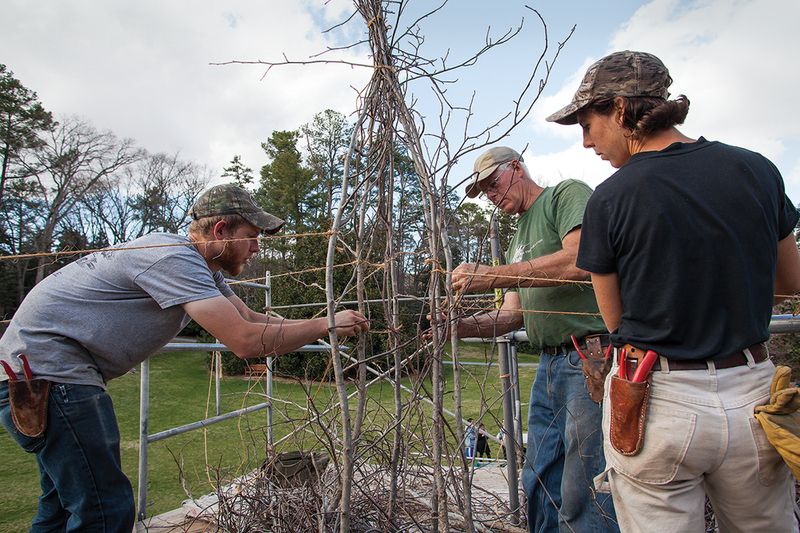 They gather branches by the truckload and construct the piece over several weeks, on an open site where passersby are welcome to walk up and engage. Once completed, the work beckons visitors to wander around and inside. “I’ve come to believe that an art object – or an art effort – requires a public. It’s relevant only because somebody’s feeding something back to you. I enjoy being part of that conversation,” says Dougherty, who exudes an air of can-do good cheer. He gives a lot of thought to how people experience his work, the memories and associations it can evoke: a walk in the forest, a first kiss, a visit to an indigenous tribe in Brazil. By telling stories through his art, he invites us to revisit our own chapters, tap into our personal lore. In the 1970s, while working in hospital administration, he bought 10 acres in Chapel Hill and built a cabin out of wood and stone he found nearby, festooning the inside with decorative elements in natural materials. That adventure honed his carpentry skills, developed his eye, and inspired him to go to art school and become a sculptor. He quickly made the leap from pedestal to monumental scale, finding satisfaction in fluid bodily motion, using his whole self to make a mark. His forms are really drawings, he says, an interplay of tapered lines that implies natural motion – growth, wind, the flow of water. For each commission, he’ll first visit the site to get a sense of the place, then sketch ideograms and jot down words to arrive at a concept and scale that resonate with the surroundings. When the installation begins, he’ll lay out a footprint and navigate the challenges at hand – for example, how to support the structure and what species of sapling are available. He rallies his volunteers, quickly dispelling their concerns about not being professional artists. “I say, ‘Oh yeah? Come on over here and get the sticks, I’ll show you what we’re doing.’ ” Then they build, line by line. “All that becomes a fabric of enjoyment,” says Dougherty. He takes on about 10 projects a year, often joined lately by his son, Sam, 23, a potter. It’s a lot of travel, but he doesn’t mind. 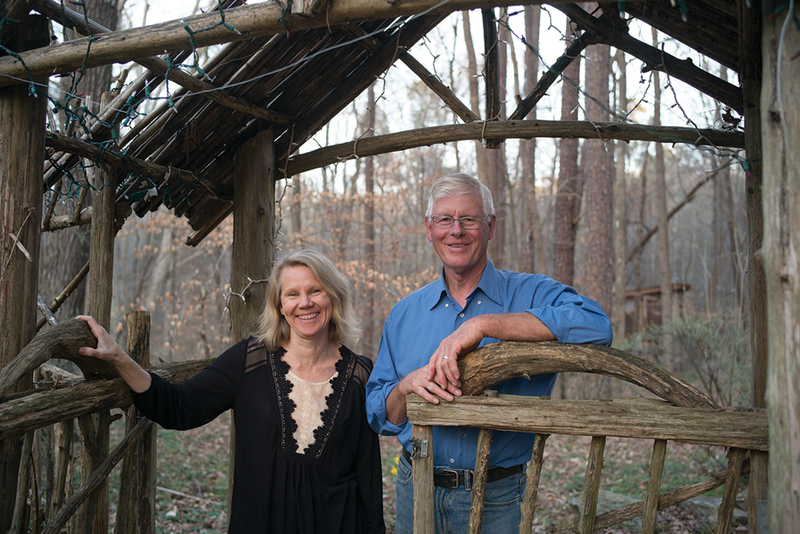 “I feel like some kind of bard, able to go from one community to another and carry forward something of each.” In between trips, he alights back at the log cabin, where he lives with his wife, Linda, chief curator at the North Carolina Museum of Art. “It’s been great to always have something that makes you feel that you’re living your aesthetic,” he says of the house, his only permanent artwork. That his structures are organic and destined not to last gives him a certain freedom. 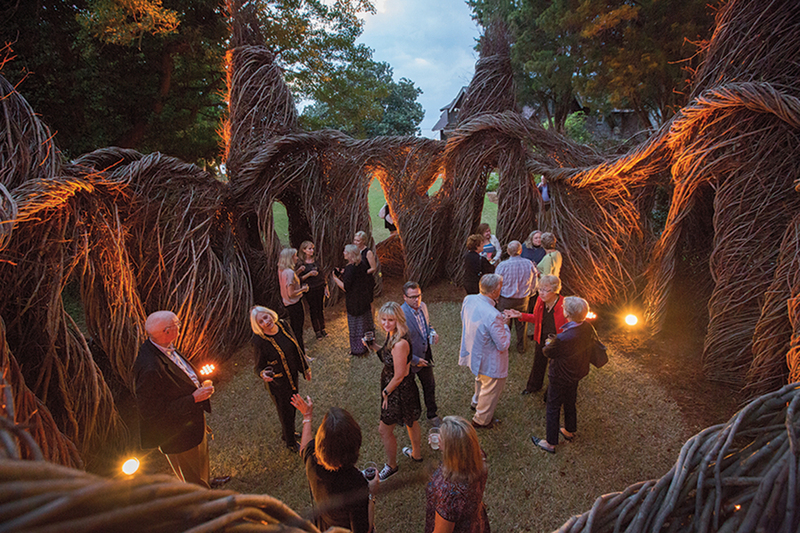 For Dougherty, the art is less the object than the experience it creates. “I’ve always thought artists should do what they want, and art history ought to look after itself,” he says. The ephemeral quality of the work, he believes, adds piquancy. 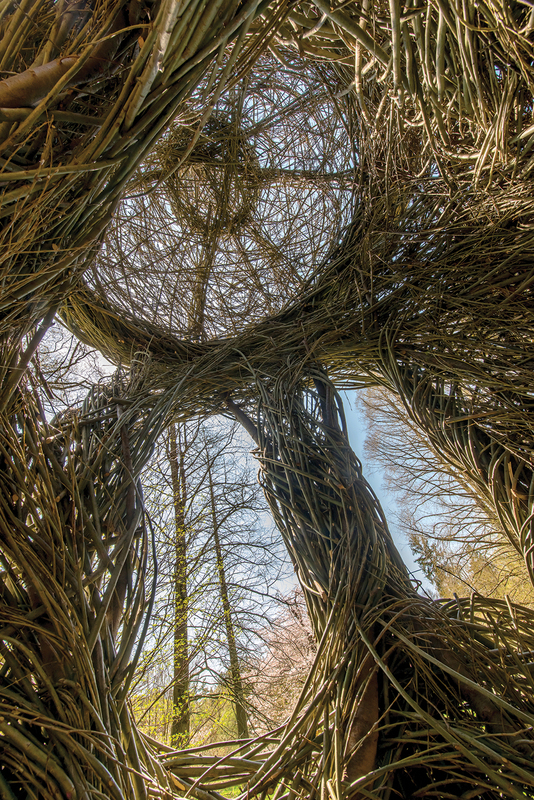 And that is how, in hearts and minds, the extraordinary visions of Patrick Dougherty live happily ever after. Dougherty seeks to make work that resonates with its environs. Wingding (2017) almost blends into its woodsy site at the Bay Area Discovery Museum in Sausalito, California. The main structure of Call of the Wild (2002) was modeled after a glass pitcher at the Museum of Glass in Tacoma, Washington. 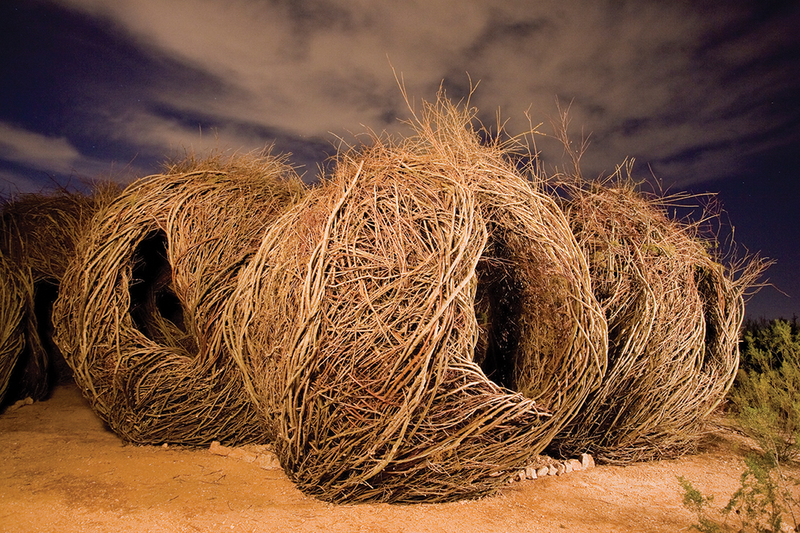 The nestlike structures of Childhood Dreams (2007) were formed by willow branches at the Desert Botanical Garden in Phoenix. Villa Tempesta (2016) is made of sweetgum saplings in Norfolk, Virginia. 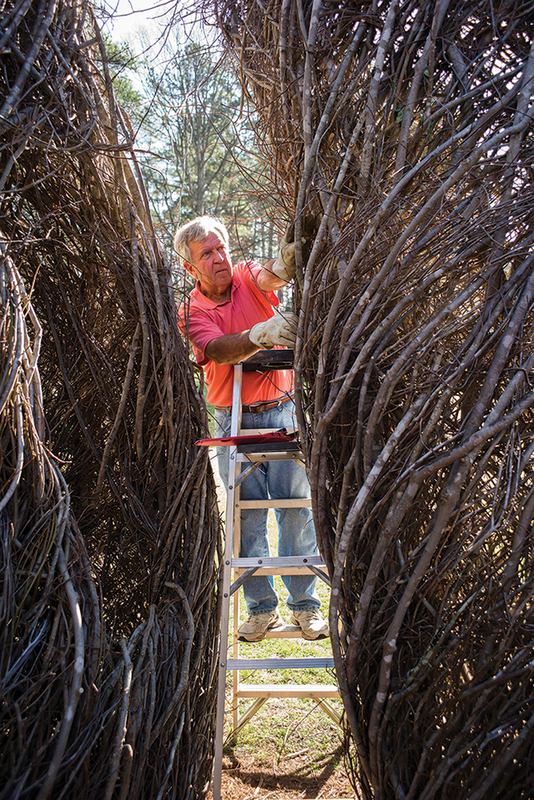 Patrick Dougherty at the front gate with wife Linda, chief curator at the North Carolina Museum of Art. Their cabin is Patrick’s only permament artwork. Art needs viewers, Dougherty says. “It’s relevant only because somebody’s feeding something back to you.” Above, Double or Nothing (2011) at Washington University in St. Louis finds fans. A volunteer lends a hand. Dougherty, son Sam, and Elsa Hoffman use strings to shape a topknot on The Big Easy. 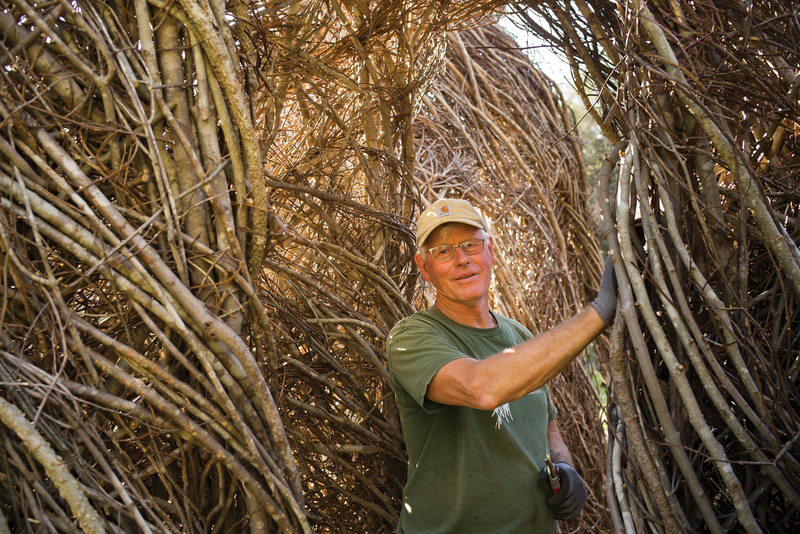 A stick is “an imaginative object,” Patrick Dougherty says. 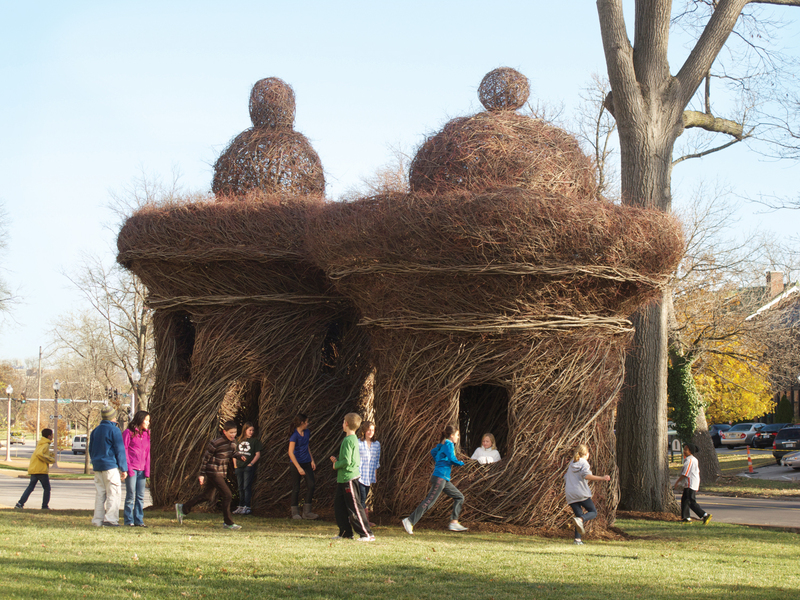 He turns that simple, natural material into enormous sculptures that bring to mind preternatural dwellings, such as A Waltz in the Woods (2015), constructed in an arboretum in Philadelphia.